Private 1br/1ba villa with all the amenities and unbelievable view!! My wife is an avid yogi here and teaches daily yoga classes just down the hill and I am a passionate surfer. We fell in love with Santa Teresa 10 years ago and have lived here for 8 years now full time and are very well connected in town! THE VIEWS, Privacy, and accessibility to town and the beach! PRIVATE AFFORDABLE 1Br ViLLAS WITH AMAZING VIEWS! 1km downhill! 3-5 min drive! SEE MANY BEACHES FROM YOUR BED! EPIC view of the coastline beaches surf and cabo blanco national park! AMAZING VIEWS OF THE OCEAN AND SUNSET! Large Toaster oven with a cooktop built into the breakfast bar! Beautiful custom teak dining table on your private first floor deck. FIBER OPTIC WIFI GREAT FOR STREAMING! There is a large shared sun deck, bbq area, and pool that is only shared with 2 other units, always private and has amazing views! My wife and I can arrange for a rental ATV as well that can be delivered upon your arrival. We are a 3-4 drive down the hill to the main beaches of Playa Carmen and Playa Santa Teresa along with all the supermarkets, restaurants, and shopping. Just let us know any questions prior to arrival and anything additional you need set up. There is also a beautiful mountain top hiking trail just outside your door that all our guests take advantage of and love! Perfect for those early morning nature hikes or sunset walks. We loved being able to check the surf from one of the decks, and thank the host for providing a pair of binoculars. They also proved helpful for spotting a troop of howler monkeys who showed up in the nearby trees. 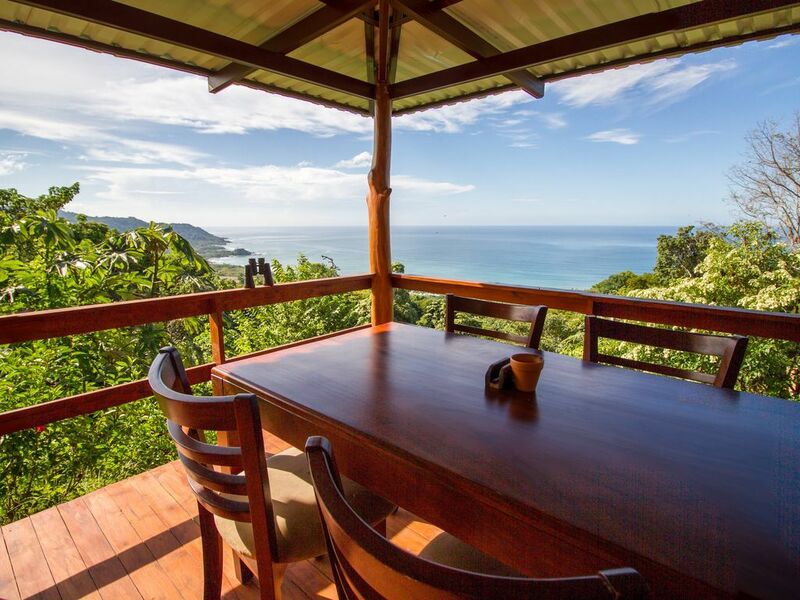 Santa Teresa and Mal Pais have some of the most beautiful beaches in the world and we are perched above them all surrounded by jungle and privacy! only a few minutes down and you are in the middle of town and all the beaches!